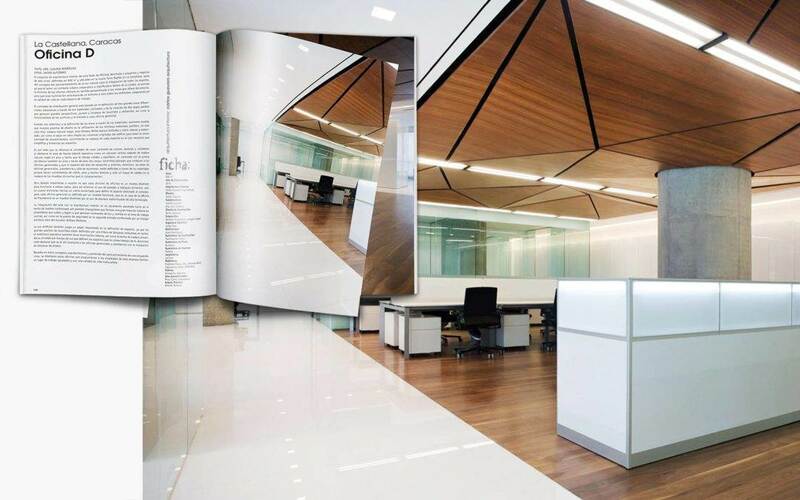 The interior architecture Project of this Office Headquarters destined to high level projects and business, is defined in 600 square meters and located in the new Digitel Tower in La Castellana. It is based on the concept of the best use of natural light for the integration of all the spaces, since having a corporate and significant urban context of the city, the division of the offices was proposed, always in perpendicular sense to the views the surroundings offer. This is performed in order for the lighting to go from extreme to the other all the environments, ensuring in this way the quality of life in each work space. The concept of general distribution is based on the definition of three big areas clearly differentiated through the materials used and the creation of two long hallways that generate great perspective, purity and cleanness of runways and environments, as well as the functionality of the files and the entrance to each managerial office. When we refer to the definition of the areas through materials, we want to highlight that our design premise is the use of the minimum possible of materials, in this case three: natural nogal wood, Mistery White, brilliant white floors, and natural and frosted glass. At the same time, leaving in the clean work the original columns of the building to have the least amount of linings, converting the nobility of each material in the necessary luxury that simplifies and harmonizes the spaces. It is for this reason that the concept of creating contrast of colors, textures, and volumes is reinforced, when highlighting the area of the operative labor strength as a central volume surrounded by natural nogal wood, in the floor and ceiling, that grants it warmth and equilibrium; in contrast with the white purity also in floor and ceiling of those two large lateral hallways that conduct to the managerial offices and that separates them from the reception and files. Likewise, the managerial office areas, presidency and conference rooms, are defined through the materials since they have window closings, white floors and ceilings and just a touch of warmth in the wood of the divisor furniture that compliment. Another important detail to point out is that the division of offices is a furniture designed on both sides, in order to eliminate the use of walls or divisor partitions. Only divisions made of frosted glass to define the space destined for the dining area. However, each managerial office is designed by functional furniture, that in the case of Presidency Office it is furniture designed by the use of high technology audiovisual equipment. The integration of art with interior architecture is clearly achieved both in the wood ceiling made by triangular panels that form a great mass of pyramidal volumes that go up and down and generate light contrasts and shadows in the central work area. Likewise, the security door in the second door is comprised by an artistic piece of the sculptor William Barbosa. The artificial light plays an important role in the definition of spaces, since the great hallways are defined by a row of embelding ceiling lamps; the operative furniture also has internal light, as well as the pyramidal wood ceiling divided by light strips that define the spaces that are covered under it. At the same time, it is important ti point out that the managerial offices and presidency were given priority in the installation of design lamps. Based on these architectural concepts, and prioritizing the use of a stupendous view, the offices are designed to offer the employees of this family business a nice work place and a beyond discussion quality of life.